A hero is someone you look up to, someone you can depend on in any situation, someone who would give up his or her life to save others. I’ve been thinking about heroes ever since I met the writer, Joe McGinniss, at the Sydney Writer’s Festival last month (see previous blog: http://wp.me/p1Ytmx-4N ). McGinniss wrote a terrific book called Heroes in 1976, about spending three years searching for the “vanished American hero,” a futile search but a rewarding one for the reader. He was in Sydney to talk about his recent book, The Rogue, on former US Vice-Presidential candidate Sarah Palin, but she certainly showed no signs of heroism. During his Festival discussion with Annabel Crabb, McGinniss mentioned his early career as a sportswriter with the Philadelphia Bulletin, and how he got into trouble with the city’s professional basketball team, the 76ers, by being critical of their star centre, Wilt Chamberlain. It was an example, McGinniss said, of how writing the truth about people could get you into hot water. Any mention of heroes and basketball makes me think of a man who should have been president, and actually ran for the office in 2000, but suffered a few bouts of atrial fibrillation, and really didn’t have the numbers to defeat Al Gore for the Democratic nomination. He had to drop out of the race. His name is Bill Bradley, a New Jersey Senator for 18 years, a Rhodes Scholar, a professional basketball player for the New York Knicks and a star forward for Princeton University, an author, a national radio host … and one of my heroes. I even wrote to his press secretary at the time, offering to help with his campaign, but they didn’t need anyone, and then it was all over. His nickname was “Dollar Bill,” which I always thought referred to his ability to hit the money shot, but apparently it was his ability to spend wisely! It’s an idealistic, American view of what the individual can do to make the nation better. Bill Bradley is a straight shooter – in fact, he had one of the best jump shots I’ve ever seen – both on and off the court. It makes you wonder what would have happened had his heart problems not emerged during the campaign, and if he had managed to snare the nomination from Al Gore. Would he have been able to beat George W. Bush in an election that turned on hanging chads? I’d like to think so. And while we’re on the subject of heroes, I came across another one after I ordered a book from Amazon by Jimmy Breslin (another of my heroes of the writing kind), a biography of the baseball magnate, Branch Rickey, who broke the color bar in the sport by signing the first African American player, Jackie Robinson, to his Brooklyn Dodgers. I’ve written about Rickey in another blog (http://wp.me/s1Ytmx-227 ). Amazon had the usual come-on about the book on my other hero: “Customers who bought this item, also bought this one.” Well, they were right. I also bought the book about my favourite baseball player, Stan Musial, of the St Louis Cardinals. “Stan the Man,” as he was known, was one of the greatest baseballers of all time, and George Vecsey, a sports columnist for the New York Times, has written an excellent biography of the man who had to play in the shadow of Joe DiMaggio, the legendary New York Yankee, and Ted Williams, the Boston Red Sox slugger. 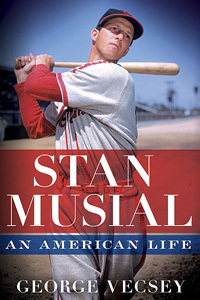 Stan Musial: An American Life is a classic tale of a Polish kid from small-town Pennsylvania, who’s humble, hard-working and has a dream – to play in the major leagues. It’s also the story of a kinder, gentler America in the 1940s, 50s and 60s, when neighbours were friendly, the suburbs were safe, the fathers put up lights on the roof at Christmas, and everybody went to church. It was also a time of racism, and Breslin’s book on Branch Rickey and his fight to get Jackie Robinson into baseball chronicles that period. And Stan Musial, as one of baseball’s most respected players, got involved in the Robinson controversy, when a sportswriter reported that the St Louis Cardinals were planning to strike rather than play against the black Brooklyn Dodger in 1947. Frick once said, according to Vecsey, that a “prominent player” on the Cardinals told people he did not care whether Jackie Robinson was white or black or green or yellow. On the Cardinals, there was only one prominent player – Stan Musial. It took a long time before African-American players were fully accepted into major league baseball, but now many ethnic groups are involved in the sport. But racism still exists in America, as it does in Australia. On a positive note, I can recommend Stan Musial: An American Life to any baseball aficionado, especially those interested in the US in the middle decades of the 20th Century … and, of course, fans of Stan the Man. Memories of a much simpler time .. Thanks, Bill. There is also a chapter in Vecsey’s book about Stan Musial on the campaign trail for JFK in 1960, with an interesting entourage of celebrities: Byron White, former pro football player and Supreme Court Justice; James Michener, the Pulitzer Prize-winning author; Arthur Schlesinger, writer and later JFK aide; Ethel and Joan Kennedy, and Jeff Chandler and Angie Dickinson, Hollywood stars. Musial’s wife of 72 years, Lil, died last month, and Stan is still alive, but not well (he’s 91). There’s a moving epilogue in which George Vecsey meets Stan Musial in his wheelchair in a St Louis restaurant. An American icon, Musial is loved in St Louis.